This is a very good article passed on to me by Lisa Vickers on whaling. It is an editorial that appeared in the Weekly Magazine AERA Heisei Zakkicho No. 31, from Japanese novelist Kaoru Takamura. What reasons support the continued practice of whaling? Despite a prevailing framework resembling that corresponding to road-use revenue, there are more serious issues at stake. Most everyone who grew up as part of my generation still has feelings of nostalgia for whale meat as a result of having been fed whale cutlets for school lunches. Gourmets are enthralled by the mention of tail meat and parboiled tail meat. Hari-hari nabe (hot pot), a typical homemade meal enjoyed by ordinary people in the past, remains an offering found at some specialty restaurants. However, whales, which until a number of years ago were not generally distributed by the food industry, are these days sold even in department stores. Thus, the large volume of whales caught as part of the scientific whaling program has in fact contributed to a glut in the market in contrast to the former status of this food as a scarce and valuable product. By the late 1940s international whaling had decimated the world's whale populations. On December 2nd 1946 the International Whaling Commission (IWC) was set up under the International Convention for the Regulation of Whaling in Washington DC. It is famous for implementing an international moratorium on all commercial whaling. Over recent decades, the IWC has taken some encouraging steps in changing its emphasis from governing the whaling industry towards conserving and studying whales. However, despite the international moratorium, the nations of Japan, Norway and Iceland carry on whaling. All 3 countries are exploiting loopholes in the Whaling Convention in order to kill nearly 2000 whales each year. Norway hunts whales under its objection to the moratorium, Japan has been whaling under the guise of "scientific research" and Iceland resumed commercial whaling, taking fin and minke whales, this year. 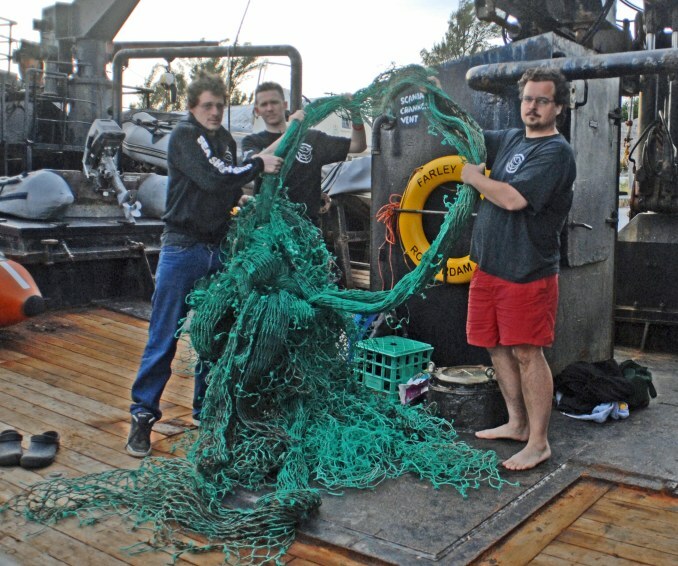 Drift net we found off Chubb Heads five days after a whale was reported entangled by the head by bright green driftnet. The whale had obviously managed to escape this 'noose' on his own. It would have been impossible to have freed a whale tangled by the head with such thick entwined net. See March 1st diary entry for more details.